Amongst the many emails from my favourite bloggers that arrive in my inbox, there are also a few online food magazine newsletters that inundate it (ok, there are more than a few). Most of the time I just give the email newsletter a once over and bin it. Sometimes, there are features and dishes that catch my eye and I actually log on and read. Food 52, Saveur and BBC Good Food are the emails I find myself opening on a regular basis. They always have such an interesting take on a classic recipe or sometimes, a genius new one. One such email from BBC Good Food had me perusing their site and reading an article on autumn recipes and so on. Amongst the many pages I flicked through, I happened upon a recipe for a pumpkin laksa. I didn’t pay much attention to it (probably because it said PUMPKIN 🙂 ) doing an once over and moving on. A few days later, I was pondering about dinner and rummaging the fridge and store cupboard for inspiration. I had all the makings for a pad Thai and/or a Thai curry and as wonderful as both these dishes are, it was very cold outside and instinctively, my body was wanting a soothing and warming soup or something with noodles. For some reason when the temperatures fall, I crave noodles. From the deep, dark abyss that is my brain, memory of the laksa recipe I had glanced upon, came rushing back. I had a vague idea of the ingredients and I just decided to make it my way with the flavours I wanted. The Chicken Laksa turned out perfectly. It was warming and refreshing at the same time. It had the comforting, warm chicken broth and noodles and the freshness of crisp bean sprouts, zucchini squash and herbs. Since variations to the traditional are quite common, I decided mine could be called a laksa and since it does take flavours from a lot of South East Asia, it is also very much, a fusion dish. The Chicken Laksa hit the spot that cold evening and has secured a spot in my “food for a chilly night” repertoire. A delicious warming soup with Thai red curry paste chicken and rice noodles, topped off with fresh bean sprouts and herbs. First, in a bowl, add the chicken slices and 2 tablespoons of the Thai red curry paste and mix together. Add boiling water to the noodles and allow to soak until soft, or follow your package directions. In the meantime, in a large pot, heat the coconut oil on medium heat and add the shallots. As the shallots begin to take on some colour, add in the chicken and begin to brown slightly. Add the garlic and ginger paste and the rest of the Thai red curry paste, cook for a minute. Pour in the tin of coconut milk and one tin full of water. Add the chicken broth and bring up to a simmer. Add the peanut butter and sugar if using. Check for seasonings, add soy or fish sauce if you need to add salt. Adjust the sweetness, if you like it sweeter add more. If you like it spicier add more curry paste or hot sauce. To serve you can drop the noodles into the pot of soup and heat up in there or you can scoop the noodles into individual bowls, add the garnishes and then pour over the soup. Have a plate of the garnishes ready and everyone can add what they want to their noodle bowl. What does your body crave on cold nights? Do you spend any time reading online magazines or email newsletters for inspiration? Wishing you all a happy Saturday! I am having a tremendous time with my brother, it has been nice to hang out with him and just chill. Nice combination of veggies you got there 🙂 If you like food52 + Savuer, you might like Epicurean, too! Thanks Francesca. I’ve looked at Epicurean but don’t subscribe to them. Nazneen, your photos of this soup are stunning! I find myself opening emails from Food and Wine Magazine. I subscribe to their daily recipe feed. I must look into Food52 and BBC. Thanks for that info. I’m pinning these beautiful photos of this soup. I love those dark, dreamy pictures! I adore that rustic vibe all over! I’m in love with your version of Laksa! What gorgeous, fragrant post! Thanks Nusrat for your lovely comment! My aunt is Malaysian and we always had curry laksa on her visits. It’s been so many years now, I forgot how much I love this one bowl meal! Thank you! It hit the spot that cold evening! I love laksa all the way, from the lighest, most spicy or even creamy…. Wow! This laksa just look sooo delicious, this made hungry! Thank you Trina! Thanks for stopping by! Thanks Bam! It’s been cold here too, this hit the spot! Oh this looks gorgeous! When I awoke this chilly morning it was certainly something that I craved to warm me up. I love a good laksa and absolutely have decided after reading your blog, that this is what we will be having for tea tonight! I awoke on a chilly morning , and found myself craving a warming chicken laksa after reading your blog this morning. Look so inviting and loved the photos! We were going to have a lamb curry tonight, but have certainly changed my mind now! The next time you make this I would be happy to come over and make sure it tastes right. This looks and sounds like something I would really love. I could eat noodles in any season but Asian flavors I could eat morning, noon and night! I am pinning this for future dinners! This is a perfect noodle soup full of harvest fresh veggies, would be delicious on a chilly night! Thank you, Pamela! It was really good and hit the spot on our chilly night. Gosh, this looks so good! And really a great dish for chilly weather. Love all the flavors you put in this – very creative. Good stuff – thanks. Thank you John! I appreciate your kind words. Nansen, the pictures are beautiful. I love laksa, and this one looks very tempting. It’s one of those dishes which work so well for parties, my friend threw a laksa party and all the accompaniments to the coconut laksa was kept separate and we had to assemble it our taste. It was fun. Enjoy your weekend with our brother. Nazneen*- the autocorrect is annoying. Thanks Asha! I love the idea of a laksa party! I am going to try that one day soon. Nazeen amazing photography of a fabulous recipe – I love that you used a base recipe as your inspiration for this Chicken Laksa – it is chock full of healthy and wonderful and also colorful ingredients – my kids enjoy eating these types of soups out of big, large bowls (not unlike the pretty bowls you used for this post) and I would really like to take the time and prepare this for my famly on one of these dreary days. Simply a wonderful post – so happy to come for a visit on a rainy Sunday morning! Thank you so much for your lovely comment! I am so glad you enjoyed it and I hope you get to make it for the kids! I love laksa, in all its variations. Yours looks great! Noodle soup=the best comfort food! And I love thai flavors and all the spice in a good bowl of noodle soup like this. We usually go to a nearby Malaysian restaurant to get our noodle soup “fix”…it’s been a while and I think we need to go soon. Better yet, I need to make this recipe. Yum! Thanks Monica! I love noodle soups and they’re easy to make which is great! Thanks Charlie! One thing about noodle soups and laksa in particular, they don’t have enough vegetables. I decided to add extras. Turned out well. 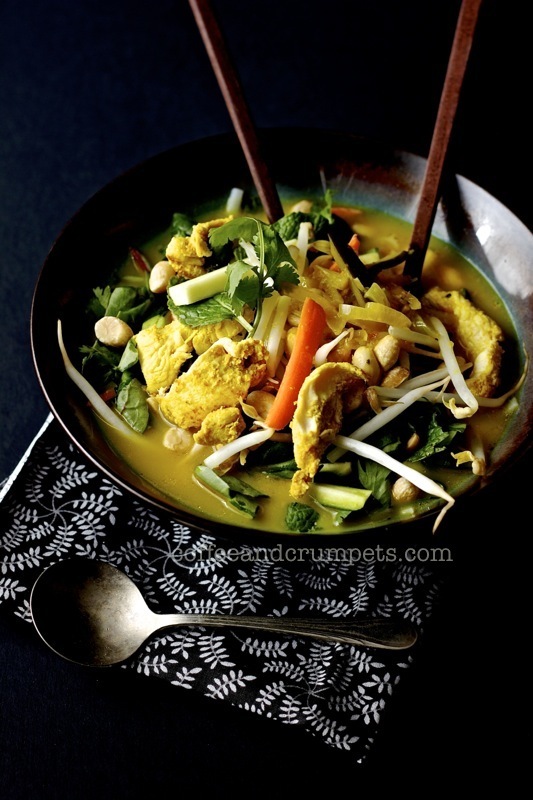 This is a family favourite…I can’t tell you how much we love Laksa! We spent the entire winter devouring bowIs of this. Now I might as well break in to the screen and grab that gorgeous bowl in your post. I love your fusion twist in the recipe..a must try on my list! I subscribe to a few websites but I am more about cookbooks and a few cooking shows. Thanks Sonali! I’ve started loving soups on cold days. They just hit the spot perfectly. I love cookbooks, but I find I never cook from them. I hardly watch any shows though. I need a big bowl of this delicious soup on these chilly, rainy days here in SA. Thanks Denise! It is really good on cold nights! I am drooooooling. The bowl of fusion looks fabulous, and I could start my day with this. Thanks Minnie! Me too! I prefer savoury things for breakfast. yes my favourite laksa. thanks for the recipe. Thanks GG! I agree, it’s hard to keep up with every new trend. I like to read about it but I don’t run out to make it!